Today, we’re happy to launch a new report, Changing What Counts, which looks at how citizen-generated data can influence the way in which governments and institutions carry out data collection. It includes examples of where citizen-generated data has directly influenced policy changes, provided concrete paths of collaboration between civil society and public institutions, and raised awareness of important, under-reported social issues. The report follows on from a previous DataShift publication, “Citizen-Generated Data and Governments: Towards a Collaborative Model”, which outlines potential ways that institutions could collaborate with civil society to support and make use of citizen-generated data. The report, written by Jonathan Gray and Danny Lämmerhirt of Open Knowledge, together with Liliana Bounegru from the University of Groningen and University of Ghent, is based on interviews and consultations with more than 50 individuals. It includes case studies ranging from the use of community drones in Indonesia to fight for social and environmental justice, to reconsidering how access to water is measured in Malawi and re-evaluating literacy rates in East Africa. 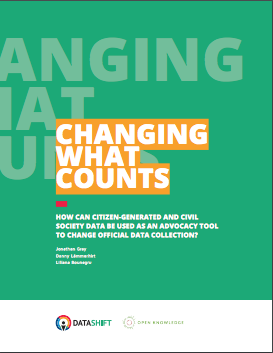 In addition to the case studies, the report provides analysis and recommendations for two main audiences: civil society groups thinking of carrying out citizen-generated data collection themselves; and public institutions and policy makers interested in making their data infrastructures more responsive to citizen-generated data. Many of the recommendations for the two key audiences speak directly to core aims of DataShift’s ongoing work: encouraging institutions to look at sustainability models to support civil society groups who are generating their own data, and using that data as a potential means of collaboration. For civil society actors, the report highlights citizen-generated data as a way of measuring issues that matter most to them – as a way of raising awareness of issues that governments or institutions might not be aware of. It also recommends that organisations clearly document the process and steps that they take in any citizen-generated data initiatives – an issue that we will be focusing over the coming months in relation to DataShift’s direct support work. For citizen-generated data to reach its true potential, international institutions and national governments must recognise the value it can bring to how, and what, they measure. We hope this report will provide people from public institutions with inspiration and ideas on how to engage with citizen-generated data, as well as useful advocacy material for civil society actors working with citizen-generated data themselves.